Previously I have briefly mentioned about the benefits of charcoal within our indoor space. How magical can the black stalks be? Before we go further into this, let's recall the previous posts about how charged ions affect our body and energy. Charcoal can be made of bamboo, ironwood, coconut etc and are processed under a very high temperature of over 1400 degrees Fahrenheit. Charcoal has very tiny pores which makes it a good absorbing agent and remove odors and toxic gases. It is advisable to put a stalk of charcoal in the refrigerator to enhance the air circulation within the fridge and to remove odors especially when you have a bunch of different foods stored. Charcoal can generate a good amount of negative ions, which have the property of giving electrons to nearby matters while the charcoal absorbs positive ions. The air which is richer in negative ions make us feel relaxed and energized like the forest bath. I have discussed quite in-depth in earlier posts. Please check the keywords. A far infrared ray is a kind of electromagnetic waves and is a radiated ray that is capable of warming matters. This ray is well absorbed by organic matters, and the human body absorbs infrared rays ranging in wavelength from 4 to 50µm. Because the infrared rays emitted by charcoal range between 4 and 16µm, the human body can take full advantage of any healthy effects of charcoal’s far infrared rays. When the human body is exposed to far infrared rays, it automatically enhances its blood circulation. Charcoal can guard against electromagnetic fields.EMF are emitted by all sorts of electrical appliances and electrical and electronic appliances, such as microwave ovens, refrigerators, cell phones, television, computers, gaming devices, etc. Studies have shown that excessive amounts of EMF may be harmful to the human body, and it is conceivable that such phenomena may cause some illnesses in the body. Oxidization is a process by which materials lose electrons. Charcoal works as an electron donor. As well as preserving foods, bamboo charcoal skin care products can preserve your skin by preventing oxidization. A countless number of totally harmless microbes live inside the pores of charcoal. In the course of water purification, these microbes are capable of decomposing toxic substances like trihalomethane, chlorine, etc. Being a material of a high density and porous, it can be used to absorb or release moisture within the indoor space, thus maintaining humidity equilibrium. Note: If you have a hard time getting to sleep at night, look around your room. If you have a television or computer in front of your bed, please change the position of the bed or move the television. If you have no choice, unplug the power before going to bed, and place a basket of charcoal stalks by the television. It will absorb the radiation. 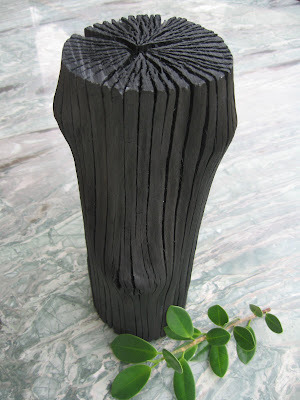 Charcoal when decorated nicely is a piece of art whether in your office and home. More importantly, it can generate the positive chi within our environment at very low cost thus enhance positive fengshui around us.